Visiting farmer's markets is perhaps more important now than ever. With that in mind, I'm reposting and linking to a handful of pieces I've written about markets in and around Tokyo. Know of other markets or have an experience to share? Let me know! I'm always up for a new market to visit! Farmer's markets seem to be springing up like seeds in warm spring soil. 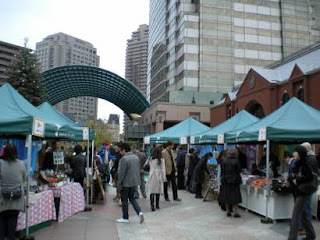 Tokyo boasts a total of twelve, including all of Marche Japon and the Earth Day Market. Throw in smaller off-shoot markets such as Shinonome, and it becomes more than possible to find fresh food generously mixed with fun on any given weekend with a minimum amount of train-wrangling. One of the more pleasant of these is the Ebisu Market. A small market - roughly twenty vendors under half as many tents visible from the Ebisu Station Garden Walkway and at the entrance to Ebisu Garden Place - there was plenty to choose from for a weeks shopping and plenty of company, too. A certain kind of enthusiasm emerges when people spy a cluster of tables showcasing vegetables and fruit. It seemed not to matter that the location was a wee bit trendy or that some shoppers were wearing rather fancy gear for their day-off outing. For one woman, I believe, 'Give me daikon or give me death!' might be an appropriate life motto. Fueled by continuing concerns over food safety, food security, and a desire to live a more eco-centric life customers arrive at the table looking for the perfect ingredient. Not surprisingly, it's often the same concerns that put the grower or produceer on the other side, too. Certainly, pelnty of fresh fruit and vegetables can be found at a local supermarket or delivered right to your door by one of the myriad services available. New stores such as SUN Grocery and Koenji's little corner market join ranks with neighborhood vegetable stalls to make fresh food available on a daily basis. Yet, there is something irrefutably satisfying about buying right from the grower. Maybe it's the recipe that often comes with the slightest prodding or learning the story of the grower or producer themselves. Seeing the weathered face of the person who can give a detailed biography of the fruit or vegetable in question, most likely even including its ancestry, makes the trip worth the time and effort. It makes everything taste a little bit better, too. American poet and philosopher Wendell Berry states that food with a story tastes better. I believe he might just be right. The Ebisu Market presented us with the usual seasonal suspects - hearty winter greens, glowing kaki (persimmons), mikan, and early yuzu - along with a selection of mushrooms, orange and purple carrots, a grand variety of daikon and kabu, sweet potatoes, and apples. It was lovely, and despite having a refrigerator drawer still rather full from a week working on the farm, my shopping bag began to fill fast. I'm a self-proclaimed vegetable otaku, and it shows every time I come home from the market. Initially drawn to one stall by a display holding hundreds of small brown balls, we met Noriko and Unikyo Sakyoen of Sakyoen Teas. 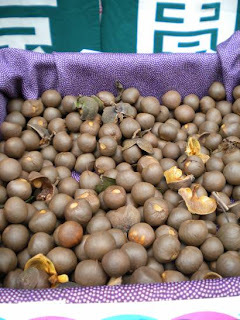 The samll balls were a sample not of the eating kind, but rather of the growing kind. Light as a feather and rough to the touch, they bobbled about easily in our hands as Sakyoen-san advised me how to plant them. Photographs of their rolling tea fields in Shizouka shimmered as green as the tea displayed before us. Hearing him speak of growing the tea from seed as well as managing the fields, it is clearly a passion in their household, and it's no surprise. Sakyoen-san and his son are the twelfth and thirteenth generation, respectively, of their family to grow tea on this land. I can't help but think of all those generations of people and hands farming and working together each time I drink a cup. How can I not? We stopped to visit another vendor selling what I at first took to be gobo (burdock root), but instead turned out to be Jinenjyo. 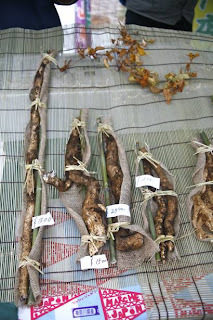 Grown for upwards of five years or more the potatoes are impressively thin and long, and are served as part of a number of traditional Japanese dishes. About as fat as my thumb but possible as tall as me (I'm about 180 cm if I practice proper posture), the potatoes grow wild but clearly can be cultivated for sale. Their vines with arrow-shaped leaves twine about above ground almost as much again. Quite challenging to harvest without breaking them off, they weren't cheap but they were impressive. A third table of the many we perused that day encouraged us to try some dried natto out on our tastebuds. A somewhat rare food-find now in Japan, we sampled organic beans with the distinct sour tang of natto but dry and crunchy. According to the Natto Earth Club vendors, dried natto was only made in Ibaraki-kin. It purports to be a fantastic source of all the same great things natto is, but without the slime. As I crunched and chatted with my companions and the vendor, I discovered another food tradition of this place I am coming to call home. I would never have learned this in the supermarket. Whether looking for an old favorite like winter squash or searching out something adventurous (like dried natto! 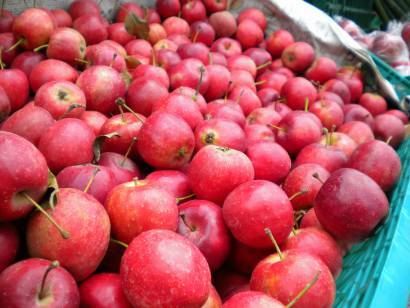 ), farmer's markets are one of the best places to begin. Let the story unfold! This story first appeared at greenz on November 26th, 2010. We have those, too, but the markets are loads of fun. I recommend them as a fun outing and a great way to get new recipes or ideas for things to grow. Better Late than Never: Seeds Potted Up!